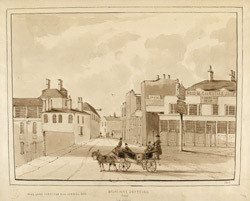 This picture illustrates Mill Lane at the Junction with Deptford Broadway. The sign on the inn to the right advertises Reid's "Entire Stout", a popular brew at the time. Mill Lane was originally known as Dog Kennel Row, as it was the site where Henry VIII kept his buckhounds for hunting. Deptford flourished during the 17th century, when its wooden cottages were home to the shipwrights, sailors and craftsmen who worked for the Royal Navy. Sea captains, foremen and officials occupied the brick built houses that lined the main streets such as the Broadway. Despite the town's reputation as a major industrial centre in the 18th and 19th centuries, the large majority of its resident families were poor. Most of the men were unskilled labourers doing seasonal work at the dockyards. Many unsavoury "fragrances" lurked in the air, as the locality was home to glue works, gasworks, tar distilleries, breweries and manufacturers of artificial manure!